If you have a question about the source of a factoid please contact us. Factoid # 51. Just south of the Jock, across McBean St. from William Birtch’s (Birch) Hotel the Methodists constructed a Chapel. In the early years of Richmond there had been little support for Methodism among the soldiers and officers; most support came from civilian settlers and a few tradesmen and merchants. In the 1820s, Richmond Methodists became part of the Rideau Circuit and were visited by “circuit riders” sometimes called “saddlebag preachers”. Meetings were often held in homes. The largest group in the Richmond area adhered to the doctrine and practices of the English Wesleyan Methodist Church a group that had left the Anglican Church for a variety of reasons including its hierarchical structure and top down decision-making. They also opposed the rituals and ornamentation of the Anglican Church. With increased settlement in the farm areas during the 1830s and 1840s other groups of Methodists gained some followers. Chief among these were the New Connexion (Connection). This branch of Methodism called for even more decentralized control and power in the hands of individual worshipers. Many of the followers of this smaller group lived south of the village in Marlborough Township and to the north in Hazeldean. In 1846, the Wesleyan Methodists built the small McBean St. Chapel. The two branches of Methodists cooperated and the 1850 census described the Chapel. ” Wesleyan Methodist built of wood held by the Wesleyans some times used by the new connection Methodists capable of holding 300 persons”. In 1866 the various branches of groups of Methodists united. In the same year, the congregation held a tea meeting to raise funds to repair and decorate the Church. About 200 people attended and heard speeches by J. Hinton, J.A. Bryson and H. McElroy. The Chapel was used until 1877 when the thenWesleyan Methodists built a new imposing church further north on McBean St.
Factoid # 52. In the 1950s the lot on the south bank of the Jock and on the west side of McBean St. (located where the M for Methodist is on the above map) held Bill Cater’s store. That is a factoid. The rest of this memory may be pure fantasy. I have a vague childhood picture of a grey, weather-beaten building well past its prime. I only remember being in the building one time as a small child and all I remember is dusty darkness. As I stood at the counter, I looked down and through a crack in the floor I could see water rushing past. In my mind it was the Jock River. Do you remember Cater’s store? What did it sell? Was it as derolict as I remember? Did the building really extend over the river? I certainly need input from others before I can turn this old childhood picture into a factoid. First Methodist Parsonage on Cockburn St.
Factoid # 53. 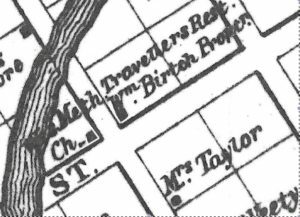 In 1852, the Wesleyan Methodists acquired lot 8 on the west side of Cockburn St. They paid £60 for both one acre of land and the premises. This allowed the Richmond Circuit to provide a parsonage for their minister. The transfer of this property sheds light on the leading members of the congregation. Named in the land transfer document were: Thomas Alcock, James Latimer, James Shellington (Shillington), Patrick McElroy, Hugh Ross, and William Cathcart. Patrick McElroy was a Richmond merchant and Hugh Ross a village wagon maker. Other leaders such as William Cathcart and James Shillington were members of respected area farm families. 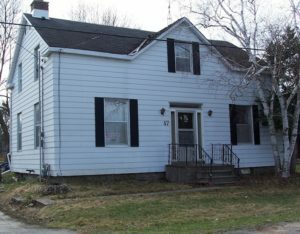 The exact date of the construction of this house is unknown but it would be before 1852 and it still stands on Cockburn St. (#47). Factoid # 54. In 1820 a baby boy, William Richmond Radenhurst was added to the family of Captain George Lyon in Richmond. In the same year Henrietta Suzannah was added to the family of Captain John Lewis as they prepared for their move from England to Canada. The two children grew up as neighbours, married, and started their own family. William took control of the Lyon family store and in 1843, he bought the land on the east side of McBean St. just north of the Jock. The combined store(on the left) and residence (on the right), which he constructed, was a cut above the new buildings to the south. It was a two and 1/2 storey building (one of only 3 stone residences in the village). The 1851 census showed William and Henrietta living in the store with their four children, three servants, and two clerks (for the store). William was also postmaster, made potash, and owned parcels of land throughout the village. Then suddenly in 1854, at the age of 34 William died. Henrietta carried on the business and also continued to buy and sell land in the village. She owned the property until her death in 1890. A busy woman she cared for her six children, and bore three more children after her marriage to the Rev. John Lauder in 1856. For more than 30 years she was the mistress of the most prestigious Anglican rectory in Bytown, Christ Church. Factoid #55. The store operated by William Lyon was far different from his father’s store of the 1820s. By 1844, the Lyon Store served a small area including Richmond and the farms directly around it. 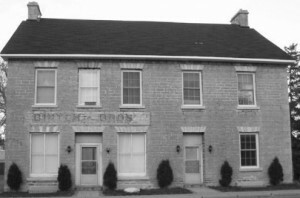 Bytown had become the commercial centre for Carleton County and Richmond was left to cater to its residents and the teamsters passing through to the Upper Ottawa. The 1820s account book provided information about the various commodities purchased from Montreal. The account book of the 1840s was a Day Book and just tells us who bought on credit each day and what that person purchased. Overall the most frequently charged goods were predictable. They were things the population couldn’t provide for itself: sugar, tea, and tobacco. The Lyon Store was the only establishment licensed to sell spirits in Goulbourn Township so whiskey made up a large percentage of its sales. The quality and quantity of specialized goods was greatly diminished. It continued to carry fabric and sewing supplies, but even an order for a top hat, a special pair of boots, or a pair of spectacles was rare. Richmond residents often came to the store several times a week and bought one or two items at a time. The customers were usually men and were often accompanied by their wives and at least one child. One can tell when local clergymen are visiting other parts of their parishes or circuits because their names disappear from the book for two or three weeks. Local farmers visited about once a month. This book hinted as to some of the other activities carried out by William Lyon. He lent small amounts of money to old trusted soldiers and bartered with some other customers. In fact Lyon would have kept at least two other sets of books: one for cash sales and another for those customers (women) who bartered butter for store merchandise. This entry was posted in churches, Locations, merchandise, Personalities. Bookmark the permalink.